Fusion DryCORE technology achieves a price that breaks ground, not budgets! Aqua Lung is the name that first introduced the world to Scuba diving more than 60 years ago when Jacques-Yves Cousteau and Emille Gagnan developed the first "Aqua-Lung". The excitement and adventurous spirit of that first dive continues today and is reflected in Aqua Lung's dedication to quality and innovation.. The ONE Skin is designed with 1 mm neoprene for added abrasion resistance in high wear areas and heavy duty Lycra panels in high stretch areas. This optimal combination creates the perfect marriage of mobility and durability. The ONE Skin attaches and removes easily from the DryCore via Velcro fasteners at the wrists, ankles and zipper. Lycra panels in high stretch areas. This optimal combination creates the perfect marriage of mobility and durability. Gatortech knees provide excellent abrasion resistance. The DryCORE Technology provides a dry barrier against the elements. 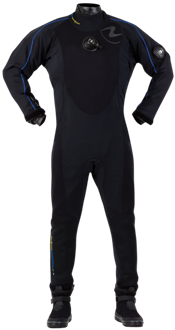 Match your thermal undergarment to the conditions just like traditional dry suits, layering up or down. The Fusion has you covered from ice diving to the tropics!